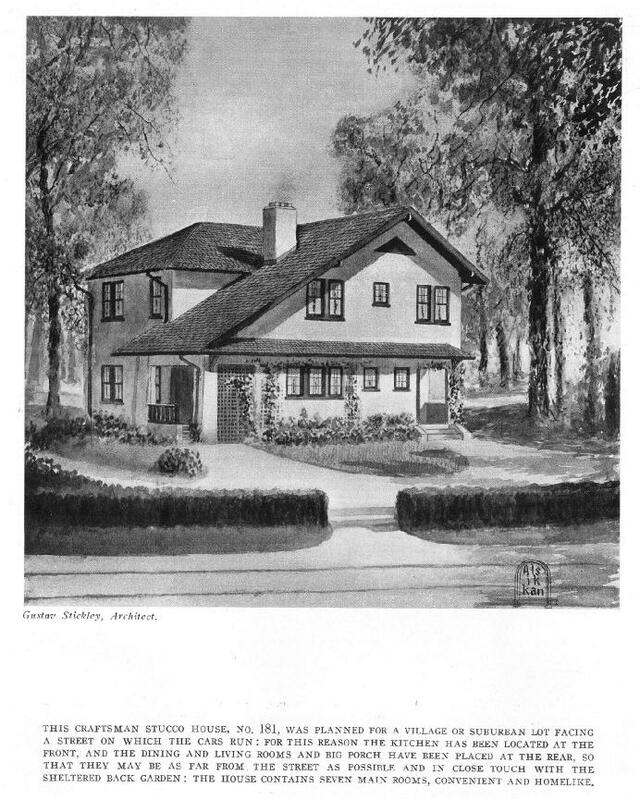 The Craftsman magazine contains tantalizing references to homes that were, or may have been, built for clients in a city. One of these homes was built in Brooklyn and has yet to be located, the rest could have been built there, or anywhere in a city. Since some references refer to visitors to the Craftsman offices, the inference would be New York or a nearby city. The Craftsman says a two-family home was ordered by a client "who owned a lot in Brooklyn 30 feet wide and 100 feet deep who desired a house that would accommodate two families who desired to live independently of one another as they would in separate houses. 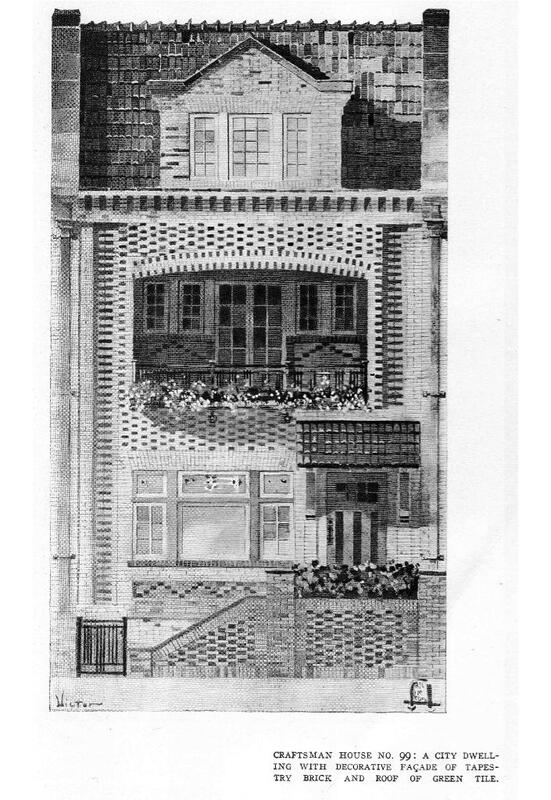 The house has been built and is now occupied. The house is of half-timbered construction, with plastered walls, a shingled roof and an outside chimney of brick laid in Flemish bond. The cellar walls are of concrete faced with split fieldstone over the grade line." This home was built 1906-07 and we know the lot size. The picture shows it on a corner lot and my guess is that the sleeping porches would have to be oriented to the south. Where is it? Has it survived? A similar design for a city lot...may have been built in NYC somewhere. Ordered by a client, again a house that could fit on a city lot. The stucco gem has Prairie School influence. While no suggestion is made that it was built for a client, at only 19 feet wide it would appear to be designed for a city lot. Stucco exterior. Designed for a client who called on the Craftsman Architectural Department in the mid-town Manhattan offices. 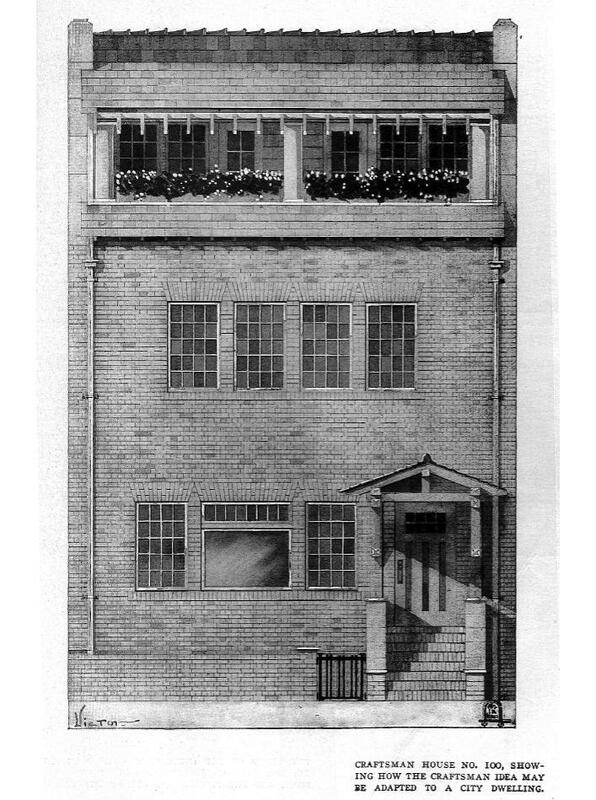 The "house was to be built in a village and the lot fronted on a street where the cars ran." Assuming “cars” means “streetcars” it is reasonable that the location would be in New York City and its suburbs or perhaps the suburbs of Newark. The house exterior is stucco and the living areas are to the rear of the home with kitchen and service rooms facing the street to block the noise of the street from the living areas. 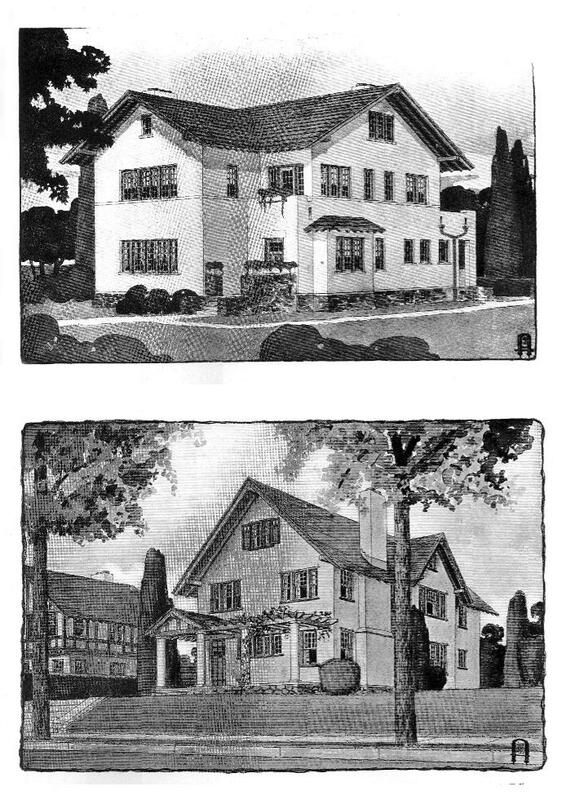 Two “row houses” designed for the city, these homes may have been built in any city, but considering that Stickley did not attempt any other designs for city living, the guess is they were designed for a client—perhaps a real estate developer, logically in the New York, New Jersey or Connecticut area. Where they ever actually built?